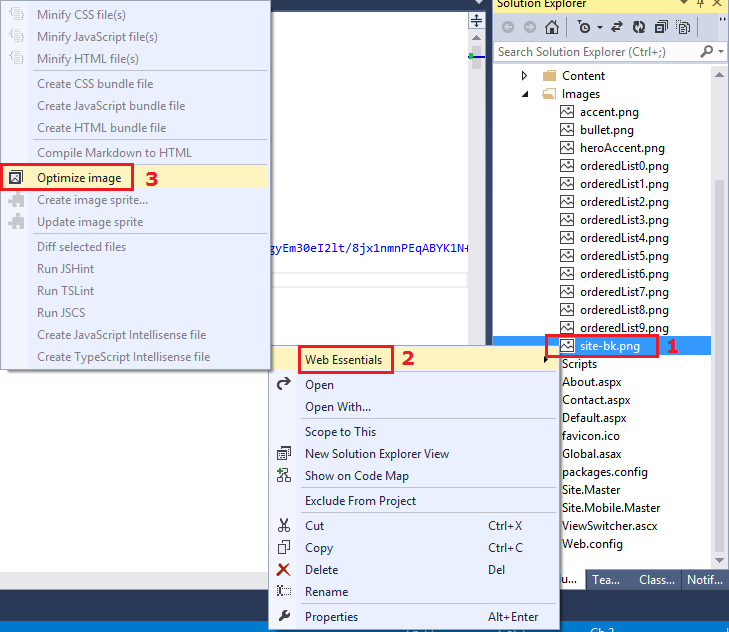 In this article you will learn about Image Optimization using Web Essential Visual Studio extension. You will learn how we can optimize individual image by right clicking on image file, how to optimize group of images in the folder, how to optimize image in CSS file and how to optimize Base64 Encode Image (dataUri) in CSS file. This extension is for all Web developers using Visual Studio. This extension was first introduced in August 2012 by Mads Kristensen. 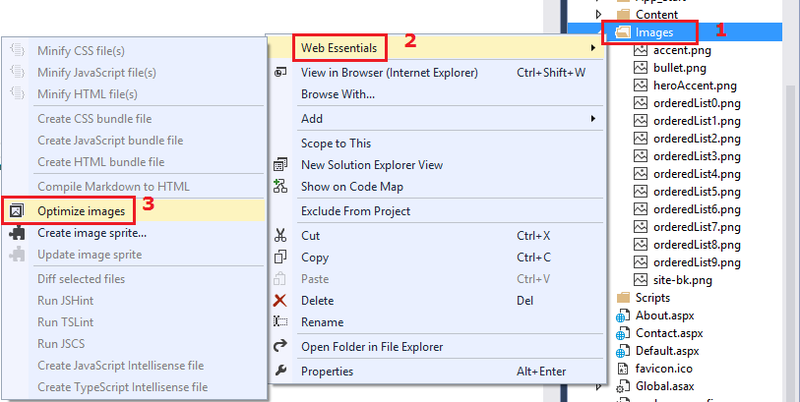 Web Essentials 1.7 for Visual Studio 2013 it is now easier than ever to work with images. If you don’t have this extension installed in your favorite Visual Studio IDE then you are missing many features, you can download it quickly from here. Now let’s start exploring image optimization techniques with Web Essentials. There are various ways we can optimize image(s), let’s look at those different ways of doing same thing. To do this, open Solution Explorer and right click on image to select Web Essentials > Optimize image. Here is the screenshot. Once we click on ‘Optimize image’, you will notice the awesomeness in the status bar below. Here is the screenshot. We can select multiple images by pressing Ctrl key and do same thing to optimize multiple images in one click. Or we can optimize folder having images, let’s look at this. Here I am going to optimize my ‘Images’ folder directly containing 14 images. Right click on ‘Images’ folder to select Web Essentials > Optimize images. Here is the screenshot. Once we click on ‘Optimize images’, you will notice the power of this extension. It saved 45% total memory. Here is the screenshot. You also get same opportunity to optimize image inside CSS file also, it also does same thing. Let’s explore this. We can optimize image from CSS files also. Just click on the image line and select ‘Optimize Image’ in smart tag. Here is the screenshot. It does same thing as we explored in point 1 and 2. 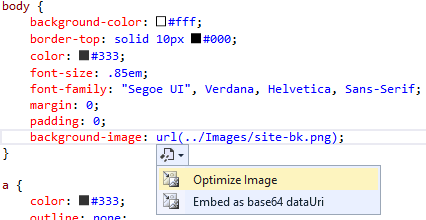 In case image is Base64 Encoded and embedded in the CSS file, we can optimize it as well. Just click on the line and select ‘Optimize dataUri’ in the smart tag. In the above smart tag you can see we also get the opportunity to save this Base64 Encoded image text back to physical file or we can Re-embed the dataUri in case image designer made any changes.